Israel successfully launched a top secret spy satellite into low Earth orbit Tuesday from an air base along the Mediterranean coast, according to the Israeli Defense Ministry. The launch occurred at 1900 GMT (3 p.m. EDT) Tuesday on a Shavit rocket from the Palmachim air base about about 15 miles south of downtown Tel Aviv, Israeli defense officials said. Liftoff was at 10 p.m. local time. The solid-fueled Shavit rocket turned west from the launch site, flying over the Mediterranean Sea to avoid endangering populated areas in Israel and Arab nations. Tracking data showed the Ofeq 9 satellite and the upper stage of the Shavit launcher were circling Earth in a retrograde orbit with an inclination of 141.8 degrees. The orbit's altitude ranged from about 200 miles to more than 360 miles. Such an orbit would bring the satellite over portions of the world between about 40 degrees north and 40 degrees south latitude, including all of Israel's Arab neighbors. Israel launches all of its satellites toward the west to reach retrograde orbits, sacrificing the Shavit rocket's lift capability for safety. Most space launches from other sites take off toward the east, capitalizing on Earth's rotation to receive an extra boost into orbit. A press release from the Israeli Defense Ministry offered no details on the spacecraft, except that Ofeq 9 is an "advanced remote sensing satellite." Weighing more than 600 pounds at launch, the spacecraft is believed to host a high-resolution optical camera to survey military activity across the Middle East, specifically Iran's nuclear program. The optical telescope's specifications are classified. 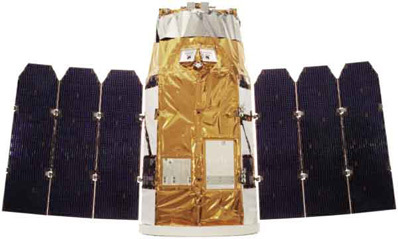 The Ofeq 9 satellite and Shavit booster were built by Israel Aerospace Industries Ltd. Elbit Systems Electro-optics Elop Ltd. provides the cameras for Ofeq satellites. "In the next phase, the satellite will undergo several tests for validation of its serviceability and satisfactory performance," the defense ministry statement said. Ofeq 9 joins two other Israeli spy satellites currently operating in orbit, including a radar-equipped craft launched from India in 2008 capable of seeing targets at night and in all weather conditions. Another optical satellite called Ofeq 7 is also still functioning in space after its launch from Israel in 2007. 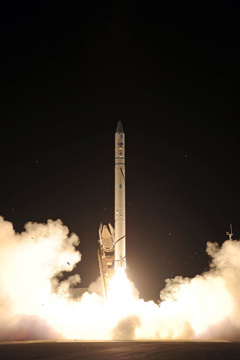 Tuesday's launch was the 9th flight of the Shavit rocket since 1988. Three of the missions failed to place their payloads into orbit.